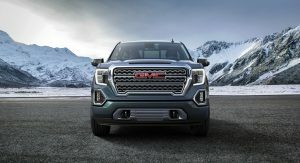 GMC has unveiled the 2019 Sierra and Sierra Denali at a special event in Detroit. 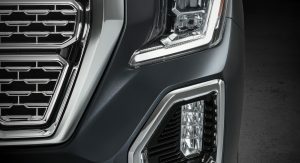 Debuting nearly two months after the all-new Chevrolet Silverado, the 2019 Sierra has a distinctive design that is further differentiated than ever before. 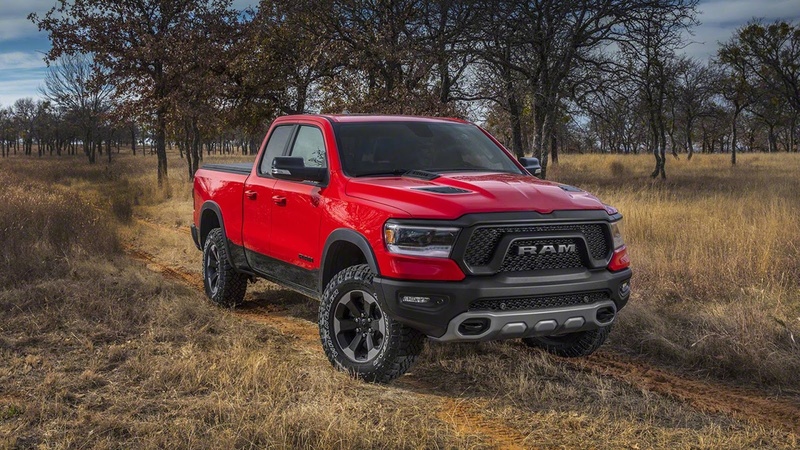 Starting up front, the truck has been equipped with a larger and more prominent grille which is flanked by Terrain-esque headlights which feature integrated LED daytime running lights. 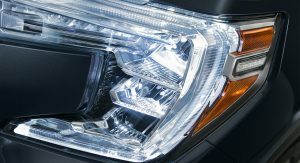 The headlights reside above vertical fog lights which are surrounded by chrome trim on the SLT and Denali variants. 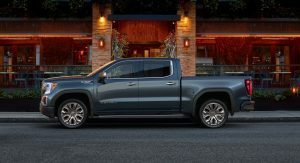 While the Silverado has sharp creases and strong character lines, the Sierra is more conservative as it retains squared off fenders and traditional styling cues. 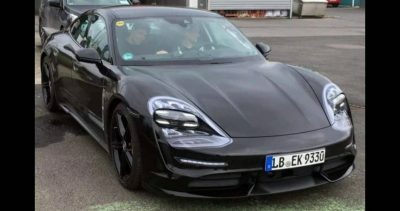 However, there are several new touches including more stylish bodywork, a revised greenhouse and an assortment of wheels ranging in sizes up to 22-inches. 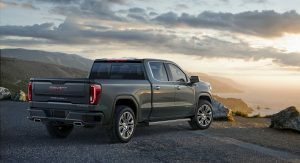 Pickup beds usually aren’t too exciting but GMC pulled out all the stops and is introducing two new innovations that will be exclusive to the Sierra. 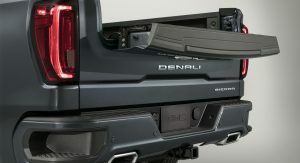 The first is called the MultiPro Tailgate and it comes standard on the SLT and Denali. 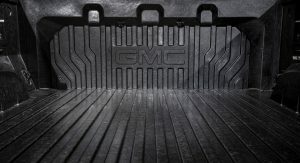 GMC says the tailgate has “six unique functions and positions” including a standing workstation mode and an egress mode which acts as a step and a seating position. 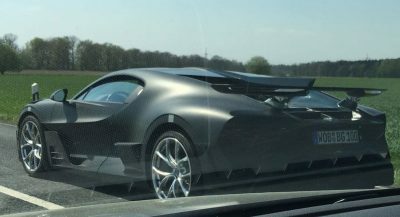 In the latter configuration, the seat can hold up to 375 lbs (170 kg). 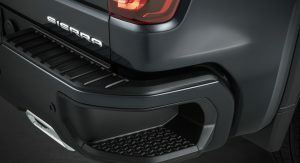 Besides the innovative tailgate, the model comes with an all-new cargo box which has a best-in-class cargo capacity of 63 cubic feet (1,784 liters) on short box variants. 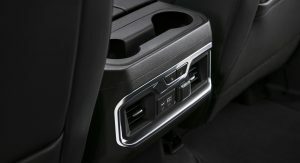 The truck bed also has additional tie-downs and a newly available 110-volt power outlet. It is constructed out of high-strength steel but it uses new materials to be 50 percent stronger than before. Not only is the CarbonPro bed stronger than the traditional steel bed but it is 62 pounds (28 kg) lighter too. 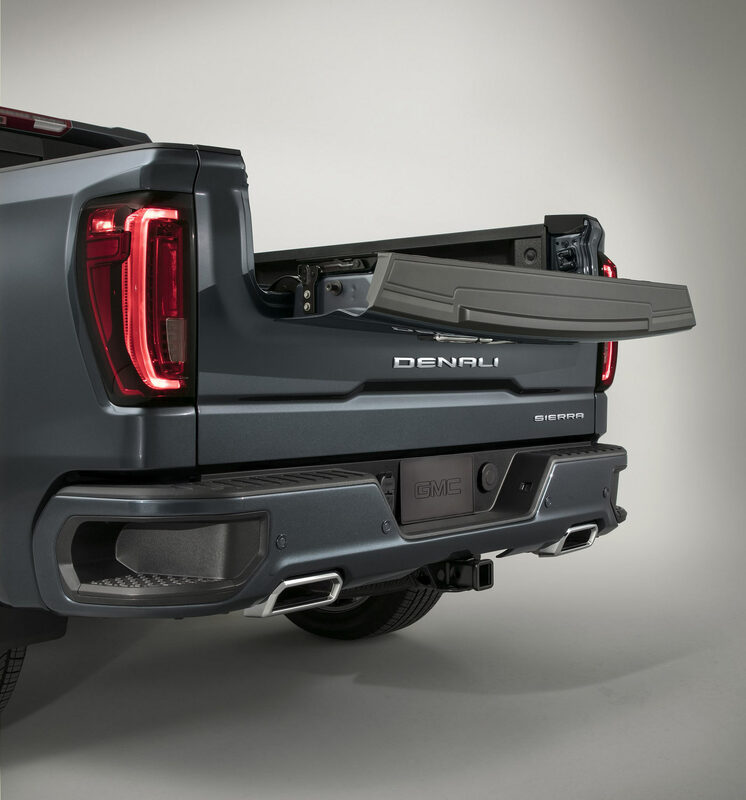 When you factor in the truck’s aluminum doors, hood and tailgate, the 2019 Sierra weighs up to 360 pounds (163 kg) less than the current model. 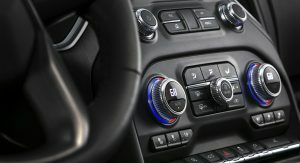 The interior largely carries over from the Silverado but there are a handful of special touches that separate the two trucks. 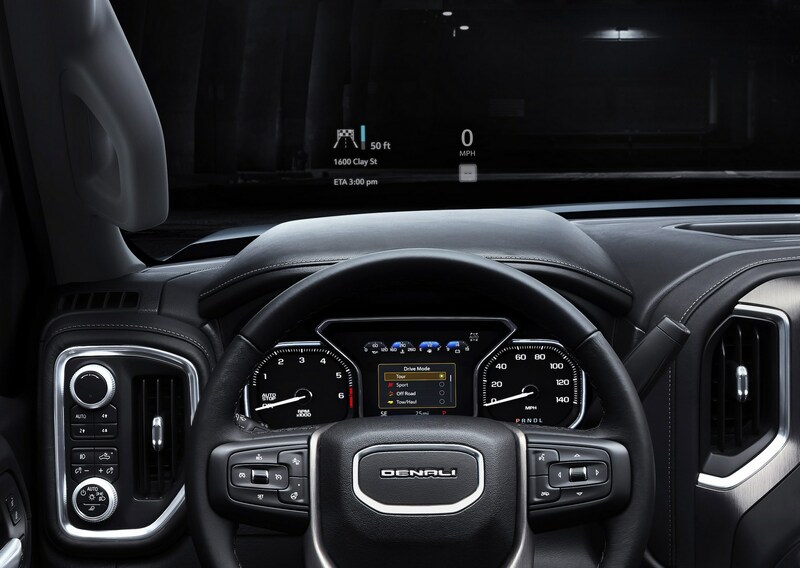 Once seated behind the steering wheel, drivers will find a GMC-exclusive instrument cluster and unique trim. 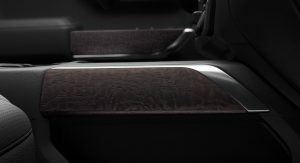 The truck also has best-in-class front head room, an additional 3 inches of rear-seat legroom and outboard rear seat backs which open to reveal new storage compartments. 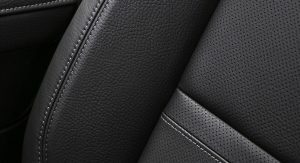 The Sierra Denali goes even further as it features exclusive leather seats with contrast stitching. 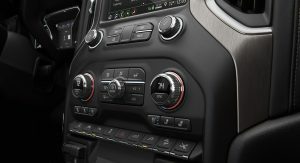 The upscale model also comes with dark-finish aluminum accents and authentic open-pore wood trim. 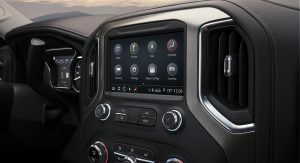 On the technology front, the truck has a new IntelliLink infotainment system and a multi-color head-up display which GMC says is a segment first. 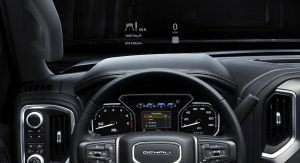 The model can also be equipped with a rear camera mirror that uses a high resolution camera and display to provide a larger field of view when backing up. 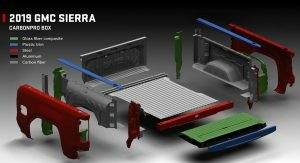 Another unique feature is the new ProGrade Trailering System which comes with its own app for Android and iOS smartphones. 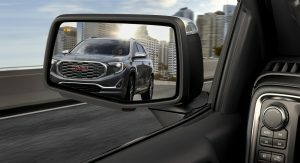 GMC says the app provides a pre-departure checklist, maintenance reminders, a trailer light testing system and a trailer electrical diagnostics tool. It also includes a tire pressure and temperature monitoring system for the trailer. 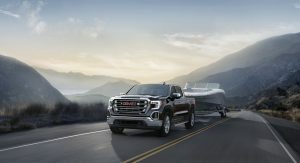 Speaking of towing, the Sierra offers a hitch guidance assistance system, side view cameras and a trailer-mounted HD camera. 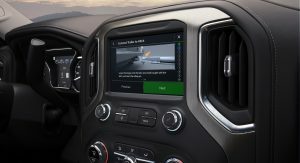 There’s even an exclusive trailer theft detection system which leverages OnStar technology to alert owners when the trailer has been detached from the truck. 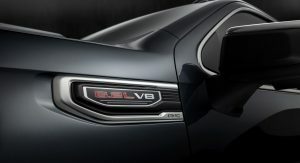 Under the hood, the Sierra will be offered with three different engines including an all-new 3.0-liter turbodiesel inline-six which will be paired to a 10-speed automatic transmission. 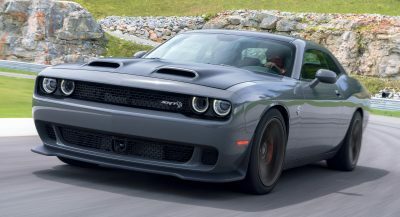 There will also be 5.3- and 6.2-liter V8 engines with stop/start technology and a dynamic fuel management system which enables them to operate on between one and eight cylinders. 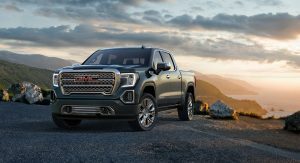 The 2019 GMC Sierra will go on sale this fall and additional information will be released closer to launch. 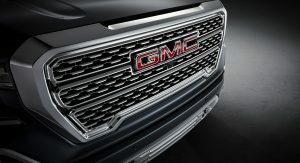 Sure looks pretty in that color and Denali trim… and decently differentiated from the Silverado. 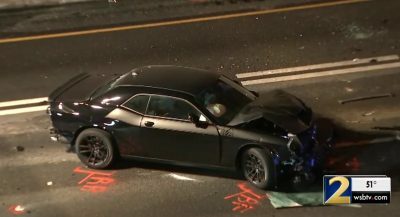 It looks more finished then the Silverado, the Silverado seemed rushed. That tailgate is preeeettttyyy awesome! I would choose the Silverado over this. 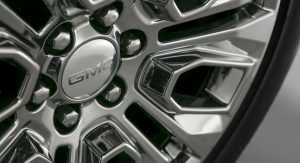 I prefer the Silverado unique futuristic “Halo” styling to the traditional style of the GMC. Definitely looks better than the dorky new Silverado. The interior looks cheap. There. I said it. And somehow looks worse then the previous gen’s interior. Ram isn’t even close IMO. Wow, I am thoroughly impressed. 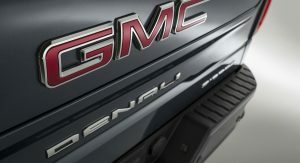 Now there’s the GMC Denali, and everything else. I THINK OF THE BIG THREE THIS IS THE UGLY DUCKLING. NOT TO MENTION A BIT OF CRIBBING FROM RAM. I THINK THE NEW ONE LOOKS PRETTY GOOD. CLEAN AND UNFUSSY. Is it just me or does anyone else miss the days when a pickup was a utilitarian appliance? Yes having a few creature comforts is nice but these outrageously ornate and super expensive trucks just seem excessive. 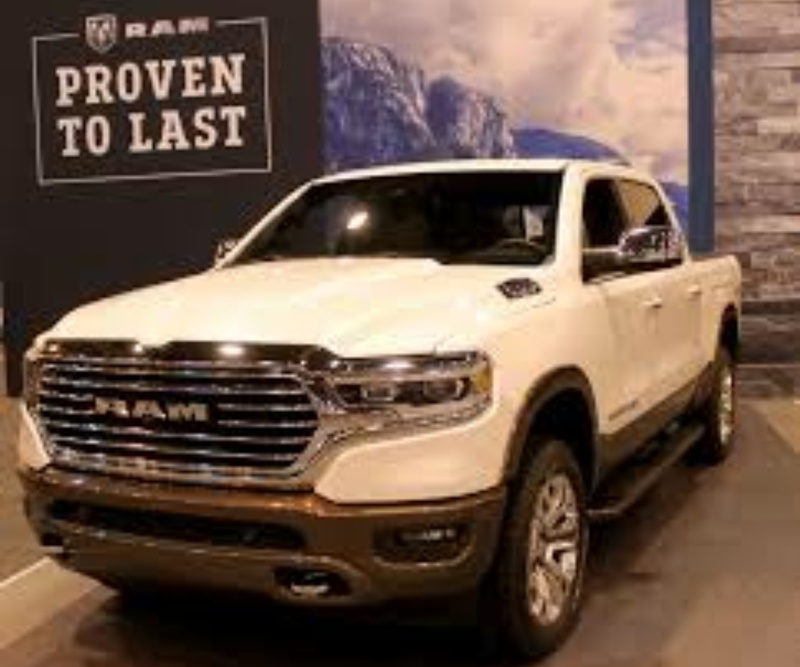 Ram box? Avalanche had it almost a decade before ram. All these trucks are wonderful out there.